I have always been one of those people who hold on too relationships and not let go even when its time to do so. I believed that until you are truly devoid of any emotion, you should fight for what you have and fix what you perceive is broken. I don't give up that easily. This has been my strength. It has also been my weakness. Lately though, especially with the last two relationships I had, I learned to just easily give up on things. I know that its wrong but because of how my previous relationships have been, I became what I never wanted to be; a quitter. 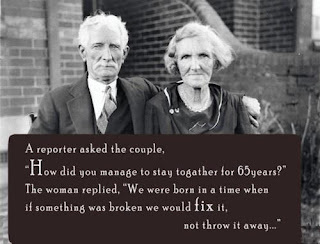 Thankfully, FM came into the picture and he has taught me that when something is broken, you fix it. You do not throw it away. He reminded me that when the going gets tough, you ride the wave and not turn around and quit. Touching post. :) Hope more people will read about this. awww, I so love what the lady says....so true! Surprise! It's a children's party!